The 2012 Infiniti FX35 performance crossover comes with a 3.5 liter V6 featuring 303 horsepower due to an all aluminum block and heads. The Infiniti FX35 includes an automatic 7 speed transmission and electronically controlled throttle system tuned specifically to the FX35’s characteristics. The engine achieves a better mileage rating for both short and long distance drives. Infiniti has released a new exterior color option (Graphite Shadow), and offers consumers a variety of new safety technologies based on each of the four models. The four different models include the FX50 AWD with 5.0-liter V8, FX35 AWD with 3.5-liter V6, FX35 RWD with 3.5-liter V6, and FX Limited Edition with 3.5-liter V6. The Limited Edition model comes with Intelligent All Wheel Drive, Continuous Damping Control, Rear Active Steer, and Intelligent Brake Assist. Limited Editions also include 21 inch wheels with all around disk brakes. Infiniti gives the FX35 consumer a variety of special equipment packages developed for each individual taste. 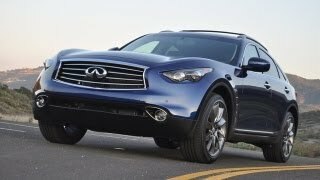 The Infiniti FX, Infiniti’s iconic performance crossover, enters the 2012 model year with big news – a revised front grille and front fascia design, revised meter illumination, standard heated front seats on all models and the addition of the new Limited Edition FX35 AWD model. Based upon the FX35 All-Wheel Drive model, the Limited Edition features an available exclusive Iridium Blue exterior color, 21-inch 10-spoke aluminum-alloy graphite finish wheels with P265/45R21 V-rated all-season tires, dark tinted headlights with Adaptive Front lighting System (AFS) and auto-leveling, and dark tinted side air vents and lower door trim. Other Limited Edition features include aluminum roof rails and roof rail crossbars with graphite finish, aluminum pedals, graphite floor mats with unique blue piping, Infiniti Hard Drive Navigation System, Around View® Monitor (AVM) and much more. Other 2012 enhancements include a new exterior color, Graphite Shadow (replaces Platinum Graphite), a new 20-inch wheel design for the FX35 Deluxe Touring Package, and a shift of the quilted leather climate-controlled front seats to the FX35 Deluxe Touring Package from the Premium Package. 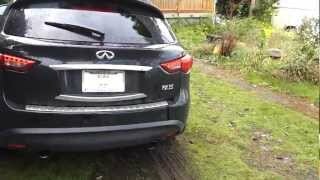 One of those rare vehicles that is equally intriguing whether in motion or standing still, the Infiniti FX is again available with a choice of a 390-horsepower 5.0-liter 32-valve DOHC V8 engine with VVEL (Variable Valve Event & Lift) or with a 303-horsepower 3.5-liter 24-valve DOHC V6 engine. Both engines are paired with a standard 7-speed automatic transmission featuring Adaptive Shift Control (ASC). The FX is also offered with Intelligent All-Wheel Drive (standard FX35 Limited Edition and FX50), double-wishbone front/multi-link rear suspension and large 4-wheel disc brakes, along with available Continuous Damping Control (CDC®), Rear Active Steer, Intelligent Brake Assist (IBA) and 21-inch lightweight aluminum-alloy wheels. The 2012 FX is offered in four models: FX50 AWD with 5.0-liter V8, FX35 AWD with 3.5-liter V6, FX35 RWD with 3.5-liter V6, and FX Limited Edition with 3.5-liter V6. Also offered is a range of special equipment packages: Premium Package, Deluxe Touring Package, Technology Package and Sport Package. Since the introduction of the original FX design in 2003, FX’s aggressive styling has served notice of its performance underpinnings with its long hood, stretched wheelbase, short front and rear overhangs. The design’s distinctive side air vents, located behind the front wheels, allow air to flow through the engine compartment and out the side of the vehicle, reducing front end lift. For 2012, FX receives a bold new front grille and fascia design with an influence from the stunning Infiniti Essence Concept. 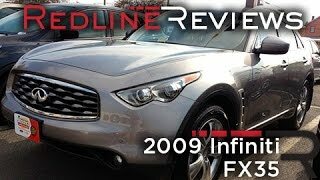 “The changes to the FX front end styling for 2012 further distinguish it from those vehicles that have chased after its design leadership for the past eight years,” said Infiniti Americas Vice President Ben Poore. “FX’s performance has always kept it ahead of the pack and once again its design does so too. FX’s pronounced performance appearance also features fog lamps and iconic High Intensity Discharge (HID) bi-functional xenon headlights. The aggressive silhouette is highlighted by a strong front-to-rear shoulder line, tight greenhouse, kicked-back roofline and integrated rear spoiler. The large LED taillights extend beyond the body, helping create aerodynamic downforce, while large dual exhaust outlets with chrome finishers cap the action-ready appearance. The 2012 Infiniti FX is offered in eight exterior colors: Graphite Shadow (new for 2012), Malbec Black, Umbria Twilight, Liquid Platinum, Black Obsidian, Midnight Mocha, Moonlight White and exclusive Iridium Blue (FX35 Limited Edition only). The Infiniti FX’s interior includes a command center-style cockpit designed to enhance the driving experience. The leather-appointed front seats offer 10-way driver’s side/8-way passenger side power adjustments and are available with a heating and cooling function for maximum comfort in any season. Heated front seats are now standard on all FX models. The available driver’s sport seat adds power-adjustable side bolsters and a manual thigh extension. The high-tech interior design includes an Infiniti signature double-wave instrument panel and Fine Vision electroluminescent gauges. For 2012, meter illumination adds a more pronounced white appearance. Also available is an automatic driving position system, which moves the steering wheel and outside mirrors adaptively into the correct position when the seat is adjusted – allowing the driver to change the seat position and keep the same mirror viewpoint and relationship between the steering column and driver’s shoulder position. The FX interior’s array of comfort and convenience equipment ranges from a leather-wrapped steering wheel and shift knob to dual front and rear cupholders, four 12-volt power outlets, power windows with front one-touch auto-up/down function, power door locks and available tonneau cover and aluminum pedal accents. Hospitality features include the Infiniti Intelligent Key with Push Button Ignition and Sequential Welcome Lighting Illuminated Entry system that starts with turning on the outside mirror courtesy lights as the driver approaches the FX and continues to light key areas as driver and passengers settle into the interior. Three available interior colors are offered: Wheat, Graphite and Java. Standard on FX50 is the Advanced Climate Control System (ACCS) with auto-recirculation, Grape Polyphenol and Plasmacluster™ air purifier that reduces interior airborne contaminants. The system includes a “Clean Mode,” which uses ionization to reduce unwanted airborne particles. An “Ion Mode” creates a high concentration of negative ions to impart a freshness and crispness to the air, similar to what people experience after a thunderstorm or near a waterfall. This system utilizes a filter using fiber impregnated with natural grape seed polyphenol, which has the ability to reduce allergens that conventional filters cannot remove due to their incredibly small size (0.3 to 0.5 microns). The FX comes equipped with an advanced Bose® Premium Audio system, acoustically engineered to optimize sound within the FX’s interior. It features 11-speakers, an AM/FM/CD player and USB connection port for iPod® Interface and other compatible devices. Also standard are XM® Satellite Radio (XM® subscription required, sold separately), diversity antenna and steering wheel-mounted remote audio controls. The advanced Infiniti Hard Drive Navigation System – standard on FX50, available on FX35 – features XM NavTraffic® with Real-Time Traffic Information and XM NavWeather™ with Real-Time Weather Information (requires active XM® subscription, sold separately), Zagat Survey® restaurant guide and Streaming Audio via Bluetooth®, along with an Infiniti Voice Recognition system for navigation and audio systems. 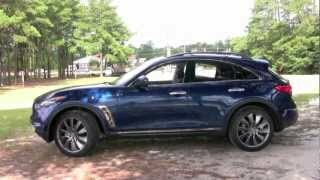 The Infiniti FX50 features a standard 5.0-liter V8 engine design rated at 390 horsepower and 369 lb-ft of torque. It utilizes Infiniti’s Variable Valve Event & Lift (VVEL) valve control technology, which continuously adjusts valve timing and lift amounts, enabling higher fuel efficiency with higher torque and improved emissions over conventional variable valve designs. The VVEL intake camshafts, which feature continuously variable lift control teamed with a Continuously Variable Valve Timing Control System (CVTCS), allow for a 6,800 rpm redline. The advanced V6 engine design also features a symmetric twin air intake system that reduces airflow resistance, Continuously Variable Valve Timing Control System (CVTCS), a silent timing chain for quiet operation, microfinished crank journals and cam lobes, and Teflon-coated lightweight pistons, a dual exhaust system with equal length exhaust manifolds and low muffler exhaust pressure to help improve engine breathing. Only one transmission is offered on the 2012 FX – a refined 7-speed transmission that offers both a wide ratio of coverage and a wide lock-up area, as well as a manual shift mode, Downshift Rev Matching and Adaptive Shift Control (ASC). The standard ASC system adapts the transmission’s shift timing depending on driving style. Solid magnesium paddle shifters are available with the FX50 Sport Package, while Infiniti’s advanced Vehicle Dynamic Control (VDC) system with Traction Control System (TCS) is standard on all FX models. FX offers independent suspension at all four corners, with a double-wishbone suspension design in front and a multi-link design in the rear. Large diameter stabilizer bars are utilized at both ends. The suspension system also incorporates special Dual Flow Path™ shock absorber technology with rebound springs for responsive yet comfortable ride and firm, tight handling. An available Continuous Damping Control (CDC®) suspension system offers special electronically controlled shock absorbers. Using input from a variety of sensors, the system continuously alters the damping of the shocks to provide optimal ride and handling. A driver-selectable switch with two settings, “Auto” and “Sport,” allows the driver to choose the desired damping mode. FX35 models come standard with 18-inch split-5-spoke aluminum-alloy wheels mounted with P265/60R18 V-rated all-season tires. FX50 models feature six-spoke 21-inch aluminum-alloy wheels with P265/45R21 V-rated all-season tires. Newly designed five-spoke 20-inch wheels are offered as part of the Deluxe Touring Package on the FX35, while a 10-spoke 21-inch wheel design is available on FX35 AWD Limited Edition. The 2012 FX makes available an array of advanced technology systems. The FX’s available advanced Around View® Monitor utilizes four small superwide-angle cameras – mounted on the front, side and rear of the FX – to provide a virtual 360° view of objects around the vehicle, helping to maneuver it in tight spots. The system uses advanced image processing to combine the images from the four cameras and provide a unique “Birds-Eye View” of the vehicle’s surroundings. The available Distance Control Assist (DCA) system helps reduce the burden of driving by helping the driver maintain a distance to the vehicle ahead in traffic conditions that require frequent braking. Whereas Intelligent Brake Assist is on by default, Distance Control Assist is available at the touch of a button. DCA utilizes the accelerator pedal to provide feedback to the driver. If the distance falls below a certain threshold when approaching the preceding vehicle from behind, when the driver releases the accelerator pedal the vehicle will automatically apply the brakes to help maintain distance to the preceding vehicle. If the driver is on the throttle and the system determines that braking may be necessary, DCA will signal to the driver that the throttle should be released by “pushing back” via the accelerator pedal. Initially a subtle push can be felt by the driver as a gentle reminder to maintain a more appropriate distance. If the driver continues closing in on the vehicle ahead, a more insistent double impulse from the pedal plus an audible signal will urge the driver to release the throttle. Upon release of the throttle, DCA will automatically engage the brakes. If necessary, the driver can override the system at any time by depressing the accelerator pedal. The available Intelligent Cruise Control (Full-Speed Range) brings the benefit of cruise control to another level, helping to maintain a preset distance to the vehicle ahead whether in heavy traffic or on open freeways within a speed range of 0 and 90 mph. ICC can be a stress reliever particularly when driving in congested freeway traffic. The ICC system operates across a wide speed range and helps the driver manage speed and distance down to a complete stop. This allows the FX to flow with traffic even at “crawling” speeds and then resume the desired cruising speed once the road opens up again. Also available on all 2012 FX models is the advanced Infiniti Lane Departure Prevention (LDP) system, which takes Infiniti’s Lane Departure Warning (LDW) system one step further. If the system senses that the vehicle has drifted toward the edge of its lane, LDP utilizes the FX’s Vehicle Dynamic Control system to gently apply the brakes on the wheels on the opposite side, assisting the driver in returning the vehicle back towards the center of the current lane. Safety features found on every 2012 FX include a seat belt reminder system; standard Infiniti Advanced Air Bag System (AABS); dual-stage front supplemental air bags with occupant classification and seat belt sensors; seat-mounted side-impact supplemental air bags; and roof-mounted curtain side-impact supplemental air bags for enhanced outboard seat occupant head protection. The 2012 FX is offered in three engine/drive configurations: the V8-powered FX50 AWD, the V6-powered FX35 AWD and FX35 RWD, plus the new FX35 Limited Edition model. Each comes equipped with exceptional levels of standard equipment. Four option packages are offered in 2012, offering an extended range of features and technology over the well-equipped standard equipment. The FX35 is available with the Premium Package (equipment standard on FX50), with climate-controlled front seats, dual-occupant memory system, entry/exit assist system for driver’s seat and steering wheel, aluminum roof rails, Infiniti Hard Drive Navigation System, 8-inch color touch-screen display, Around View® Monitor with Front and Rear Sonar System, and more. The FX35’s Deluxe Touring Package includes 20-inch wheels and tires, aluminum pedal accents, Maple interior accents, quilted leather-appointed seating and tonneau cover. The Sport Package (FX50 only) features sport-style front seats, solid magnesium paddle shifters, dark-tinted side air vents and lower door trim, Continuous Damping Control (CDC®) and Rear Active Steer. The Technology Package (FX50 and FX35) includes Lane Departure Warning (LDW) and Lane Departure Prevention (LDP), Intelligent Cruise Control (Full Speed Range), Distance Control Assist, Intelligent Brake Assist (IBA) with Forward Collision Warning (FCW), Front Pre-Crash Seat Belts, rain-sensing windshield wipers and Adaptive Front lighting System (AFS) with auto-leveling headlights.